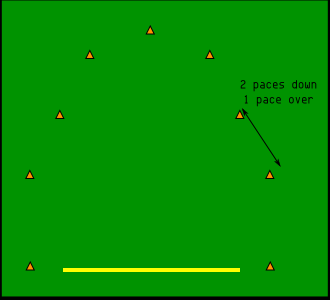 "How to Set Up a Goaltimate Field"
That's cool. Where did you get the hoop? Ok, only a few say the last one, but they have said it. Then there's the group of people who won't give goaltimate a chance. They'll either sit out and wait til there's 10 people and then want to jump to full field 5 on 5 ultimate, or they'll play grudgingly. There seems to be another small group of people who believe that goaltimate is too hard on their bodies (knees and ankles) who also won't play unless they've got 5 other people begging them to. But I'm digressing. A benefit of goaltimate is that it can be played in smaller areas. I've played inside in basketball courts. Can't do that with ultimate. Also, nice large grassy areas tend to get chewed up quickly. But smaller ones not so much. 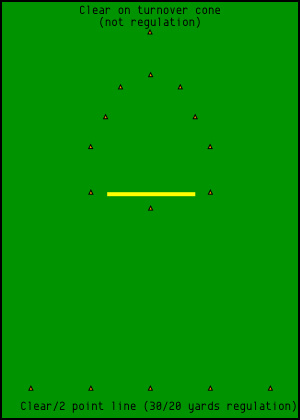 So you can usually play goaltimate on a better field (often it's right next to the ultimate field). 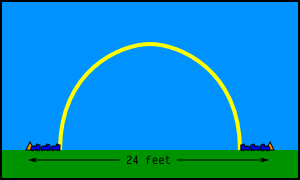 Because the hoop is fixed in size, it's important that it be set up the correct distance of 18 feet. Here's an easy way to do it. If you got a pvc set (with 8 pieces) connect 4 of them. That will be 16 feet long, so stick a foot on each side and you've pretty much got 18 feet. If you've got the nicer aluminum poles, find the middle and mark it with a sharpie. Here's an illustration that should make it pretty clear. Setting up the pole is a two person job. (As is taking it down). 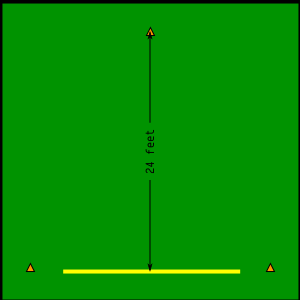 Have a person on both ends of the pole and put both ends on the stakes at the same time. People seem to be wary of making the pole bend, but it will do it. The goal line cones are set inline with the hoop, 3 feet away from each stake, making them 24 feet apart from each other. From the back cone I work my way around with 3 more cones on each side. 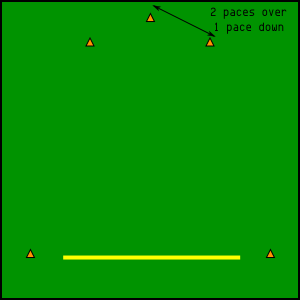 Continue in the 2/1 pacing around. If your players tend to goaltend a lot and don't like the 3 second rule (or just step out if front of the hoop and poach there), you can make the crease in front. The rules specify that you can't hang out in the area 1 yard in front of the goal either. From here on out I'm no longer "regulation". I've never seen a circular field in the different games I've played at. Most are either rectangular or boundless. When we play indoors, we play rectangular (obviously), and we play without boundaries outside. Regulation calls for a clear line of 30 yards that arcs out from the hoop. And then a 2 point line (that is parallel to the goal line) at 20 yards out. 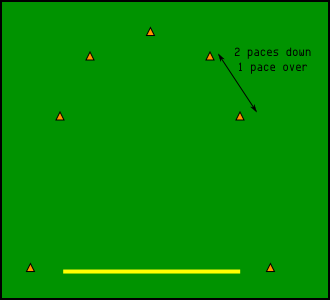 Again we normally just set up four cones about 20 yards back for a clear/2 point line. 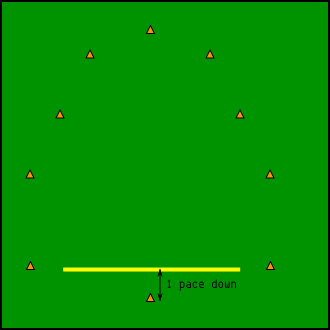 The distance of 20 yards can be tweaked depending on energy levels, number of players or field size. 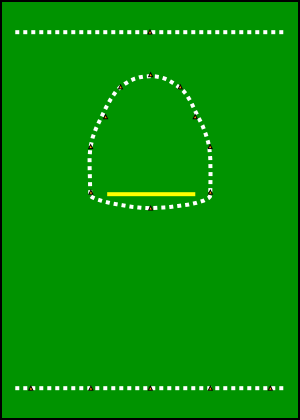 Another (non-regulation) tweak that we add is a cone about 10 feet behind the endzone. This is the "no-clear" area. If the disc ends up behind it on a turnover, you don't need to clear. Some people are confused in that they think they can clear it there as well. NO! If they pick it up behind the cone, then they are cleared, otherwise the only way to clear is the normal clear line. We normally play 3 on 3 or 4 on 4. If we've got more people, then we'll sub on error. What that means is if you throw an uncatcheable throw, or you drop a catcheable throw, you sub out. This tends to give everyone a pretty fair playing time.